I was in Hong Kong with Mom2Ashley for a week for work from 30th March to 7th April. Our meeting ended on Friday the 4th. Mom2Ashely returned home on the 5th, I stayed on another night and slept over in my ex classmate’s house. A classmate I’d not met and contacted for almost 15years! It was really nice to catch up and meet up with her, her husband and her extremely friendly 2 sons! Before you say, “Oh.. lucky you, another overseas work trip.” Hold it. The shopping was nice, but we worked hard. Everyday, we started at 9am and never ended earlier than 8pm except for the last day since it was a public holiday for our Hong Kong colleagues. It was a tough week, long hours, lots of heated discussion and even a shouting session. It wasn’t fun at all. Luckily, the shopping kind of make up for it. I’m still recuperating from the mental and physical exhaustion from the trip. Ha. Anyway.. here are some of the photos captured during the non working hours. Upon arrival, Mom2Ashley and I headed for the nearest restaurant for a bowl of wonton mee. It’s just the size of a rice bowl, and cost HK$26 (RM11) for it. This is our only lunch the whole team had togather at the same table. Hosted by our Hong Kong colleagues. Tuesday dinner was Vietnamese, in a very nice setting. 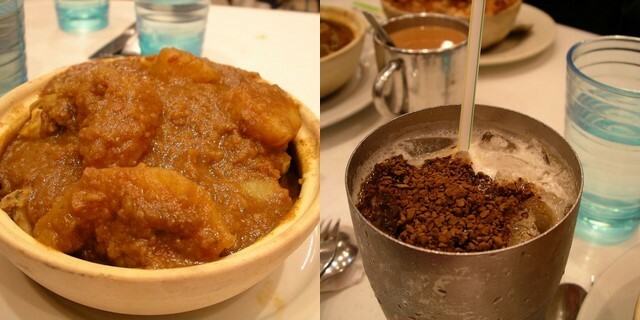 While in Hong Kong, you should not miss the famous Yee Shun milk custard (義順雙皮燉奶), I ordered the one with red bean. Had the worst lunch in this Macau Char-Chan-Teng. I ordered Portugese curry chicken, yucks! The white chocolate coffee was good though. The most expensive dinner was in this Teow Chew Restaurant. 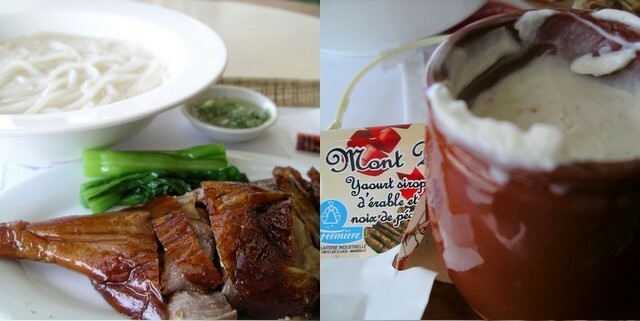 HK$1500 (RM630) for the below dishes for 4 (one vege dish is missing from the below collage), expensive!! This is the exterior of the Teow Chew Restaurant. Last breakfast with Mom2Ashley before she left. The stew duck was rather tasteless. The fish skin that can be ordered separately is my all time favourite. My ex-classmate treated me to lobster dinner on my last night in Hong Kong. It was yummy! Lobster with Bee Hoon (米粉/rice vermicelli). My ex-classmate brought me to those neighbourhood shop, I ordered porridge (can’t have enough of them) and cha-liong (炸两), which is not available in Malaysia. Yiu-tiao (油条 or fried dough) wrapped with Che-cheong-fun (rice roll). Quite delicious. Whatever time that’s left after dinner, we spent walking about the streets in Hong Kong. 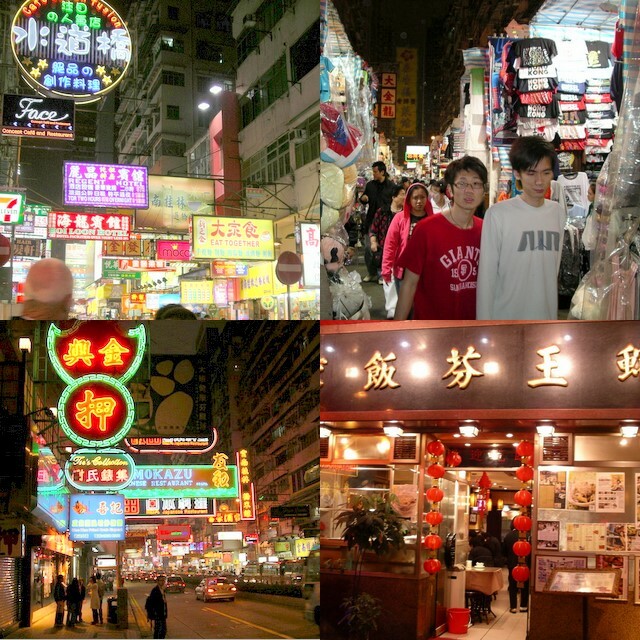 Around Causeway Bay, and Women Street (女人街) at Kowloon. 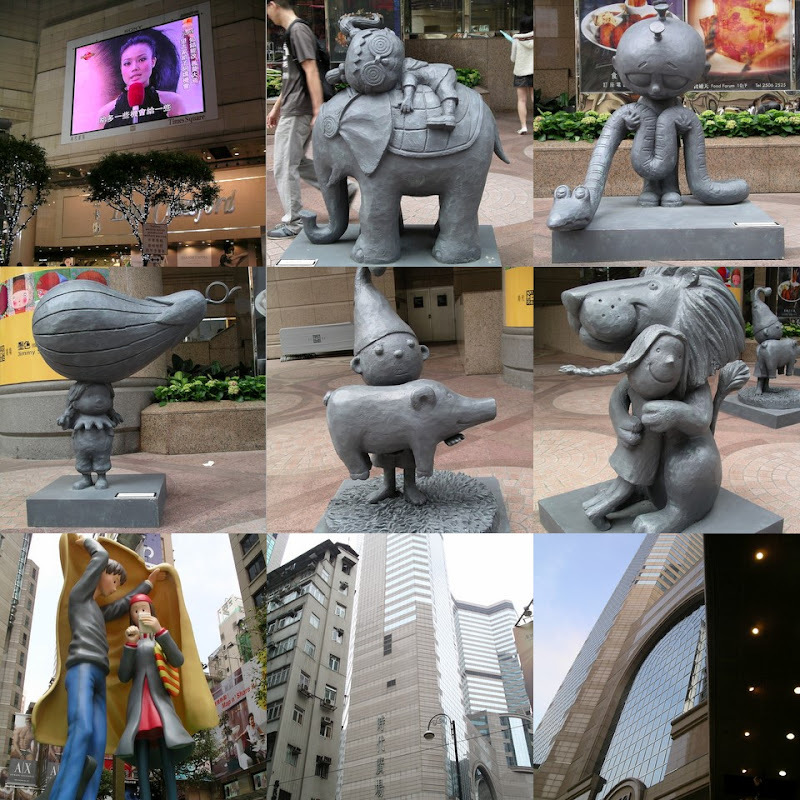 Since we stayed in Causeway Bay, spent our last day shopping in Time Square. 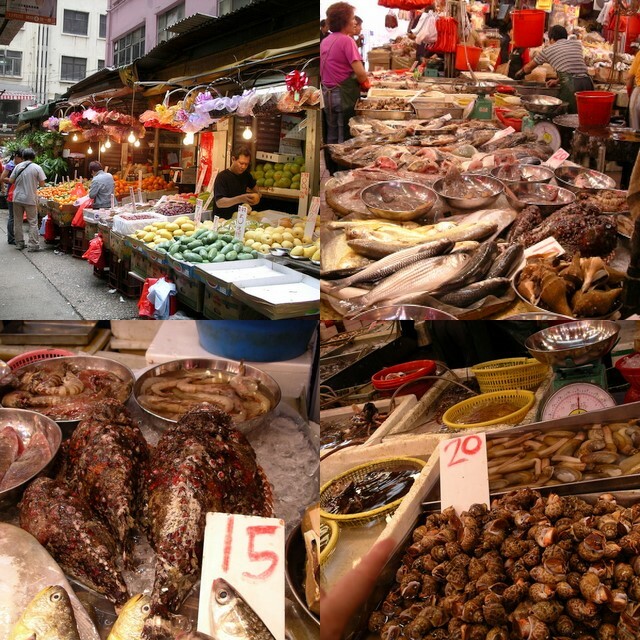 Fruit market at Causeway Bay, and fish market near Sai Wan (西环). Most seafood sold is alive and swimming. When you are in Hong Kong, you should try to go on the ferry ride to and fro Kowloon and Hong Kong island. It’s a cheap way to see this great view (I think it was HK$1.20 per ride). View of Hong Kong side from ferry. View of Kowloon side from ferry. My ex-classmate’s appartment in Pok Fu Lam (薄扶林) has this killer view! Girls dressed up as angels hired to stand and block the exit of the building, so that people are forced to walk through the rest of the shops in the building. Spotted a car decorated with Sanrio characters. 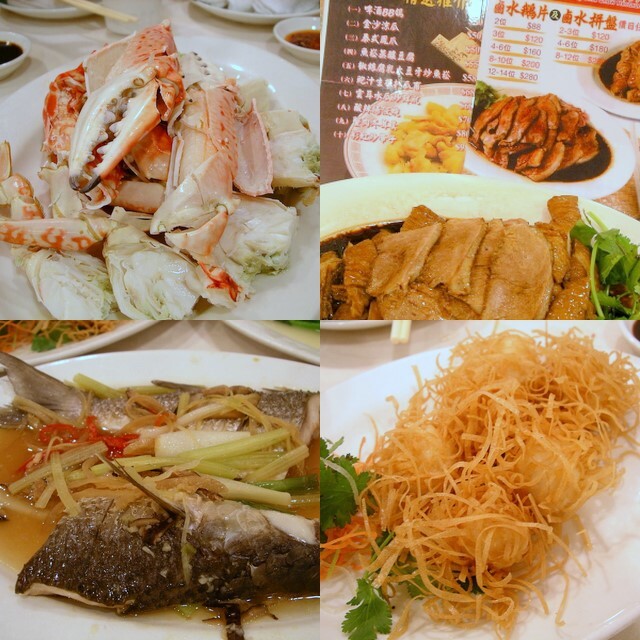 Hong Kong ppl sure know how to eat. Do you feel that HK is a little congested? Every hour also you see ppl on the street like they do not need to work. nice nice nice……damn….you had the yummy yoghurt when I was gone???? darn…. and i love the day photos taken while you were on the ferry! The view from the apartment so scary ler!! which floor you are at? although it is fun travelling there, but seems that working life there is not as leisure as msia yeah…..
you can get yummy ‘cha liong’ at the chinese restaurant (li yen) at ritz carlton in kl. So MUCH food!!! Hong Kong is so vibrant! And your pictures convey that feeling so well..
i just feel like going to HK now..
wow, u managed to take so many pics! glad you had some fun at least while working so hard too. The shopping is good but the food is even better! aside from the cockroach porridge experience, i think overall u guys really enjoyed the food and the shopping and sight seeing too. In any case, if you miss the Yiu-tiao, I have tasted it in a hotel here in Penang, and it’s quite good. angels that block one’s way. really strange. Food in HK is pretty expensive. Just a simple wantan noodle at some shop costs so much. Waaaaahhhh… on what floor is your ex-classmate’s unit lah? So damn high? Gayat man! Hahaha! cool information…. will come in to check it out if i go HK again..